It’s a very light night in the Big 12, as the only matchup is Texas Tech facing Wofford at home in a pre-Thanksgiving matchup. The real action starts tomorrow and Friday, with multiple Big 12 teams commencing play in their holiday tournaments. Before we look ahead to tonight, let’s look back at last night. Here were my picks from yesterday (click image to expand in new tab). Watch out world, because I’m almost back to .500 on the season. I’m hot! A 3-2 in non-Big 12 games pushed me to 24-24 in those games this season. I’m 12-13 ATS in Big 12 games for a 36-37 overall record. Baylor continued their great week and followed up their win over Wisconsin with a comeback victory over Creighton on Tuesday night. Baylor overcame a lot; they were down 40-28 with 18:00 left and faced 15.9% win probability per Kenpom. Their PG Manu Lecomte didn’t play great, going only 2-8 from the field, scoring only 9 points as he turned the ball over 3 times. The defense of Creighton’s Khyri Thomas really bothered him. How did Baylor pull it out? A lot of credit should go to King McClure. McClure played his best game as a Baylor Bear, scoring a career-high 19 points. Scoring his career-high isn’t what made it his best game; it’s how he did it. McClure has been a spot-up shooter his entire career. Last season, 40.5% of his possessions came in spot-up situations, per Synergy Sports. He only had 15 possessions all of last season as a pick and roll ball handler. Against Creighton alone, he had 8 possessions as a pick and roll ball handler. McClure establishing himself as more than just a spot-up shooter could provide huge dividends for Baylor. Oklahoma State recorded a necessary win against Pittsburgh yesterday afternoon in the consolation game of the Legends Classic. Pittsburgh is terrible, perhaps the worst team in a Power 5 conference, so that was a win Oklahoma State NEEDED to win if they want to keep any hope alive of making the NCAA Tournament. Losing to Pitt would be a bad sign. It was great to see Jeffrey Carroll back in action looking like Jeffrey Carroll. In his season debut against Texas A&M, Carroll scored only 4 points on 2-12 shooting from the field. Against Pitt, Carroll scored 29 points, going 10-17 from the field, 2-5 on 3-pointers, and 7-7 from the FT line. The guy is a terrific scorer, and I’m hopeful we’ll see many more nights like that from him once we hit Big 12 play. Oklahoma State will need that from him to be competitive. I won’t mention the Kansas game much here (I didn’t plan on giving it a blurb at all), but dear god. The Jayhawks scored 1.54 PPP last night and went 19-36 from 3-point range. It was the highest PPP a Bill Self coached Kansas team has ever had. This offense with all those shooters and floor spacing is something else, man. It’s Tuesday of Feast Week, and there are three Big 12 teams in action today. The highlight is Baylor playing Creighton in the final of the Hall of Fame Classic. Before diving into today’s game, let’s take a look back at yesterday’s ones. 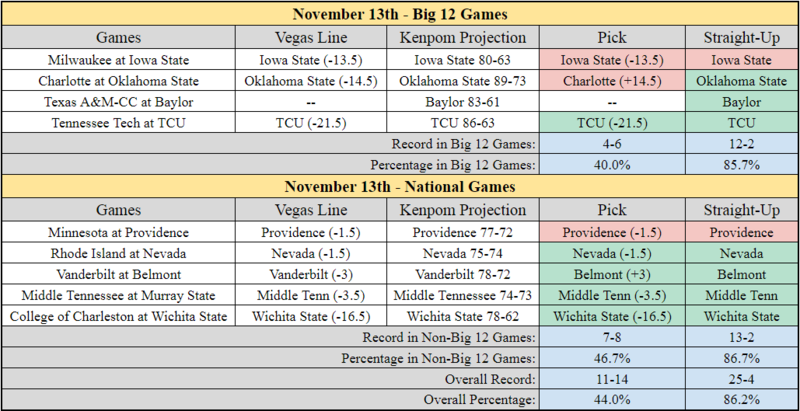 Yesterday was my best prognostication day of the year, as I finished 4-1 in Big 12 games and 3-2 in non-Big 12 action. I’m approaching .500 in ATS picks on the season, so let’s see if I can keep it going tonight (click image to expand). Baylor had a good win last night against Wisconsin, winning 70-65. The margin ended up being much closer than it should have been, as the Bears were up 53-34 with 11 minutes left in the 2nd half. The offense stalled out at that point, and Wisconsin made a comeback. It was still a very good performance by Baylor, though. Jo-Lual Acuil was a serious presence, scoring 19 points and recording 10 rebounds. He was a consistent factor on defense at the base of that zone, altering shots and deflecting passes. His first half was simply terrific, as he scored 16 points and grabbed 8 rebounds in that first half. I’m going to break down his performance further in this week’s upcoming Power Rankings post. Oklahoma State faced their first real test of the season on Monday vs. Texas A&M, and to say they struggled would be an understatement. The Cowboys lost 72-55 and scored only 0.78 PPP (points per possession) on 20-67 shooting from the field. Their eFG% was only 32.1%, by far their lowest of the season. They shot 3-24 from 3, and Jeffrey Carroll was 2-12 from the field in his first game of the season. It couldn’t have gone much worse for him in his debut. Despite the struggles on offense, the Cowboys still are showing some greater resistance on defense this season than they did at many points last season. Even in a blowout loss, they held Texas A&M to 1.01 PPP and forced turnovers on 26.8% of Texas A&M possessions. A&M was just too much to handle on the interior with their massive frontline, as the team shot 58% on 2-pointers. In other action, Kansas State, TCU, and West Virginia all recorded easy wins against sub-200 competition at home. All three teams play in holiday tournaments this upcoming weekend, and we should learn more about each of them then. Feast Week is here! After this upcoming week, we’ll have gotten to see every Big 12 team play a legitimate opponent rather than the standard cupcakes you schedule at home in November. We’ve already seen Kansas, Texas Tech, Iowa State, and West Virginia face some quality competition, but that still leaves six teams who we haven’t seen face high-major or quality mid-major foes (and West Virginia will play in the Advocare Invitational this week for some more tests). This is a great week for seeing how teams will look and perform once we reach conference play. Here’s my results from yesterday and current overall record against the spread. I’m 7-11 in Big 12 games and 18-20 in non-Big 12 games (click image to expand). Just a quick Saturday morning post coming up. Three games today in the Big 12, and the highlight is Texas Tech getting their first real test of the season against Boston College in Connecticut. 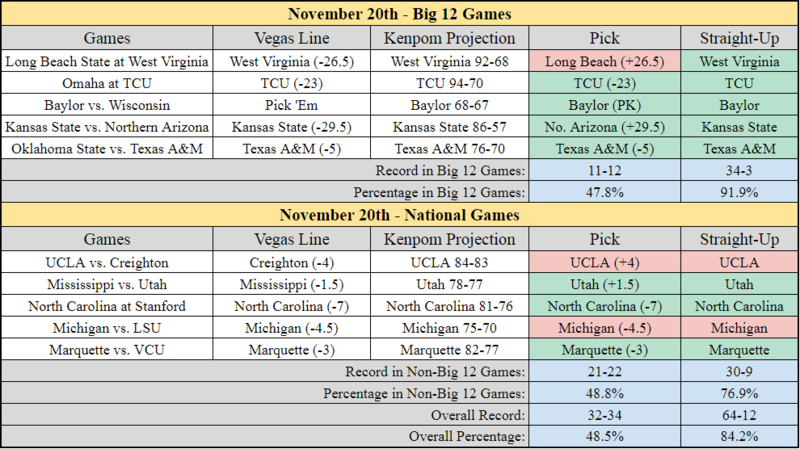 Yesterday, I had a 1-2 day against the spread in the Big 12 and 3-2 day outside of it for a 4-4 day overall (click image to expand). Two of those losses were by half a point, with Iowa State winning by 2 and DePaul losing by 9. The Iowa State one was a real killer as they were up 4 with 6 seconds left, and Tulsa took a late layup as the buzzer sounded. Take a 3 next time! That’s one of those results that are tremendous to witness in a Vegas sportsbook. I was in Vegas over March Madness last year for the last-second Oklahoma State cover against Michigan on a 3-pointer at the buzzer. Those types of finishes are the best. Four games in the Big 12 tonight. The highlight is Iowa State facing Tulsa in the semifinal of the Puerto Rico Tip-Off in Myrtle Beach, SC. Another interesting one is Kansas hosting South Dakota State in Lawrence. Before we dive into some of these matchups, let’s look at how I did yesterday. There are three games in the Big 12 tonight. Much like earlier this week on Monday, none of these are great games. Every opponent is outside of the top-130 in Kenpom. The best game is Oklahoma hosting a potentially feisty Ball State team, who only lost at Dayton by one point in their opener. Kansas won a close game 65-61 in which their offense did not play up to its usual level. Their PPP (points per possession) was only 0.93. They really had difficulty getting anything to fall from the perimeter, shooting 29% from 3 on 8-28 shooting. Devonte’ Graham and Lagerald Vick went a combined 2-10 from behind the arc. Like I predicted in yesterday’s post, Kentucky’s lack of perimeter shooting killed them, as they went 3-13 from deep. Their strength, which is their size and offensive rebounding also wasn’t quite good enough. They grabbed 10 offensive rebounds, at a OReb% of 32%, but Kansas outperformed them there, surprisingly. The Jayhawks grabbed 38% of their misses, getting 18 offensive boards. And inside, Udoka Azubuike played terrific, scoring 13 points on 5-5 shooting and grabbing 8 rebounds. His performance was very encouraging. I’ll talk more about him in my Power Rankings post tomorrow. Here are tonight’s games and my picks. Nothing great here in the Big 12, so I will be extra quick in today’s quick hitters. As always, lines are from VegasInsider and are as up to date as 10:00 AM CST on Wednesday. Just like last night, there are four more games tonight in the Big 12. The highlight of tonight is the Champions Classic, featuring Kansas facing Kentucky (and #1 Duke facing #2 Michigan State in non-Big 12 action). Before we look at tonight’s games, let’s look back on last night. Yesterday was my best day against the spread in non-Big 12 games, finishing 4-1. I will take it! I wasn’t as successful in Big 12 games, so it’s a good thing I didn’t decide to focus my blog on the Big 12… Hold on… Wait, what? Here are those picks from yesterday. (Click image to see in new tab). Yikes. Iowa State. It was a really rough game for Iowa State last night, as the Cyclones lost by 18 points despite being favorite by 13.5. That’s a 31.5-point swing right there. What went wrong for Iowa State? Well besides everything, they were really bad on offense again, scoring only 56 points on 0.84 PPP (points per possession). They had an assist/turnover ratio of 5/18 (Monte Morris is currently shuddering). They actually had more turnovers than made field goals, as they only made 16 shots compared to those 18 turnovers. They turned it over on 27% of their possessions against a Milwaukee team not known for forcing turnovers (233rd in the nation last season in Def TO%). And on defense, they couldn’t stop fouling, as they their Defensive FT Rate (free throws attempted/field goals attempted, or FTA/FGA) was 56%. Last year, their average on the season was 25.6% (top 10 in the nation). It was a truly terrible performance, and I’ll dive into Iowa State’s struggles thus far more in my Thursday Power Rankings feature. Elsewhere in the Big 12, things went as expected. TCU, Baylor, and Oklahoma State all recorded big wins, and each covered the spread. Baylor struggled the most, as they were only up six points at halftime before pulling away in the 2nd half to win by 24. Oklahoma State is showing some serious chutzpah on defense, as their first two opponents (Pepperdine and Charlotte) have recorded PPP of 0.67 and 0.87. It’s only two games and competitive strength is a thing, but they are playing much better defense currently compared to last season’s performance on that end. I’m 11-14 against the spread so far this season and 4-6 in the Big 12. Let’s get to today’s games. Here are my picks (click image to expand). Lines are from VegasInsider and are as up to date as 2:00 PM CST on Tuesday.